After six straight years of a hot real estate market, increasing at 12.21% per year on average in Playa Vista, 2018 brought a little ice to the party. Rising interest rates, political uncertainty, stock market uncertainty and an increased supply of homes for sale all contributed to a shift in the national and local real estate markets. 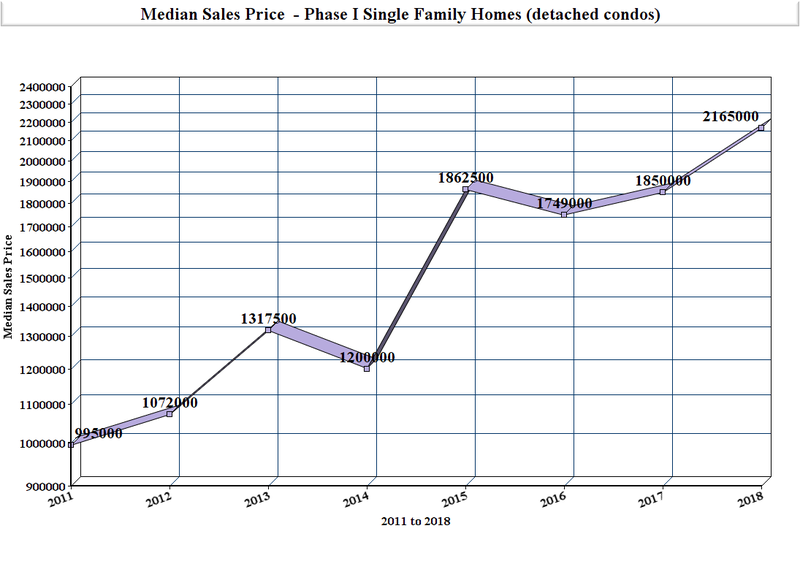 Within the Playa Vista Phase I condo and townhome market segment, the year over year median sales price increased by 1.67% from 2017 to 2018, $989,000 to $1,005,500. 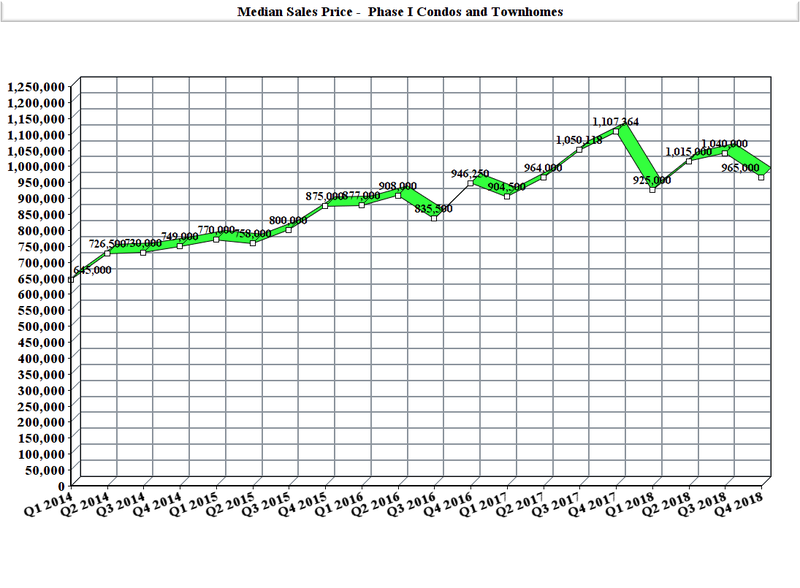 Still an increase in the median sales price, but at a much lower rate than the previous 6 years. During 2018 more inventory and fewer closed sales contributed to the slow down in appreciation. Comparing new inventory coming to market from 2017 to 2018, 37 more homes were listed for sale in 2018 (162) than in 2017 (125), a 29.60% increase. The number of closed sales decreased from 122 to 88, a reduction of 27.87%. The median days to sell increased from 15 to 18 comparing 2017 and 2018. It is important to note that the time it took to sell a home over the first 6 months of 2018 was 12 days and the second half of the year the median days to sell went up to 21 days. This coming year we predict the median sales price to increase by 3% – 5% from 2018 levels. We expect new inventory to reduce by 10% from 2018 and the median days on market should move closer to 38 days to sell. Get real time market updates for the Phase I Condos and Townhomes! Historically still considered low, the increase in rates contributed to a national and local slowdown in real estate sales during 2018. 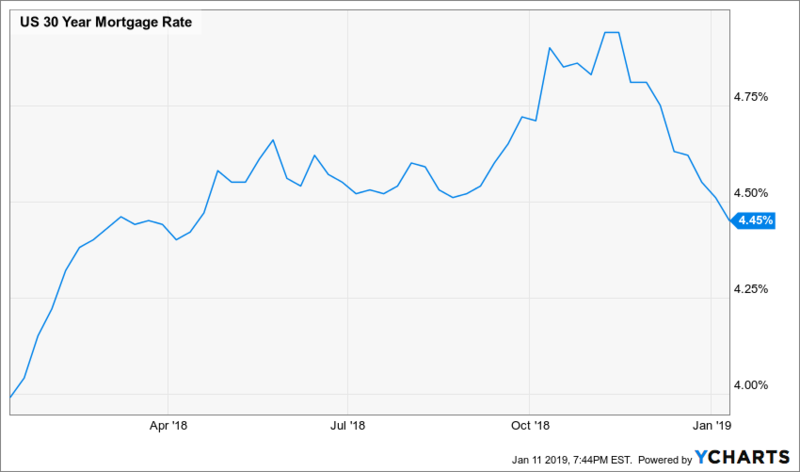 The 30-year fixed mortgage rates started at 3.99% in 2018, peaked just under 5% in November and then finished up around 4.5% at the end of the year. So far in 2019 the 30 year fixed rate has hovered around 4.5% extending a window of lower rates that should encourage buyers to make a move sooner rather than later. In Playa Vista the market has picked up in January and we believe some of it can be attributed to the dip in rates. The C.A.R. (California Association of Realtors) forecast predicts the average for the 30-year fixed mortgage interest rate will rise to 5.2 percent in 2019, up from 4.7 percent in 2018 and 4.0 percent in 2017. All in all 2018 was a really good year for increasing values of Phase I Single Family Homes. During 2017 it took 84.79 days on average to sell one of these properties and in 2018 that decreased to 40.66 days. At the same time the median sales price increased by 17.03% from $1,850,000 to $2,165,000. Much like the condo and townhome market, the highest sold prices were achieved in the beginning of the 2018. The highest sales price on record for a Mondrian Plan 3 and Capri Court Plan 1 were sold during this period. As interest rates and days on market increased, buyers started watching rather than buying which slowed sales and prompted sellers to reduce their prices. While the median sales price increased by 17.03% in 2018 for single family homes in Playa Vista, it is important to note there were only 9 closed sales. With so few closed sales its hard to show an accurate trend for the segment, but it is definitely positive. The same goes for Phase II Condos and Single Family homes. Get real time market updates for Phase I Single Family Homes! The Phase II Single Family Home and Condo markets had a very steady year in 2018 with homes selling relatively quickly and with increasing values. The first half of the year produced a few record breaking sales in the Camden community. As the year went on, closed sale prices cooled a bit and days on market increased. Both of the new developments from Brookfield, Jewel and The Collection, are nearly sold out. 12 of the 14 Jewel homes have been sold and prices have ranged from the high $3,000,000’s up to $4,500,000 for one of the model homes. The Collection has limited inventory to sell in 2019. The Plan 1 homes have ranged in price from $2,100,000 and up to $2,500,000 or more for premium locations. The Plan 2 homes have been selling in the high $2,000,000’s and low $3,000,000’s. For the Plan 1 properties, most of the homes coming up for sale in 2019 from the builder will have Bluff Creek locations and they will be priced at a premium. Get real time market updates for Phase II Single Family Homes! This is the first year since Phase II started selling (2014) that all of the Phase II Condo sales on the MLS were resales. Of the 12 total Phase II condo sales, 5 of the them were the Plan 3 versions of Mason, Cleo, Skylar and Camden (2 of them being Cleo properties). With Phase II condos, the number of new listings and closed sales was nearly the same in 2018 showing a very positive absorption rate. The average days on market decreased from 64.13 to 36 from 2017 to 2018 which is also very encouraging. Get real time market updates for Phase II Condos! The last six months of 2018 were relatively slow for Playa Vista compared to the activity we have seen over the last few years. Homes are definitely still selling but they need to show amazing and be priced right. Over the last 2 weeks, pending sales increased in Playa Vista from 7 to 15 homes and the active homes for sale have continued to hover around 39. This increase of the absorption rate over the last 2 weeks is very positive for our community. For the beginning of 2019, homes are selling at the same rate as they are coming on the market. The South Bay and the rest of the Westside are following suit with increased activity in 2019. Our belief is that this will continue as we head into the Spring and Summer. We will definitely see additional inventory after Super Bowl and after Presidents’ Day weekend but our feeling is that more buyers will be looking to purchase at this time as well. With more inventory, Playa Vista is now in more of a balanced market rather than the heavy sided sellers’ market we’ve have experienced the last 5 to 6 years. In the recent past there were so few homes on the market and they sold so quickly it was difficult for buyers to tour the different floor-plans and complexes before having to make a decision. Now, buyers have some time too narrow in on what works for them. This is another reason why sellers will want their home to stand out from the competition. Home preparation, staging, marketing and pricing strategies will be key in 2019. Since I first purchased a home in Playa Vista in 2006, it has been amazing to be a part of this constantly changing and improving community. I’m excited to see what Playa Vista has in store for us in 2019! These analyses were made in good faith with data from sources deemed reliable, but they may contain errors and are subject to revision. Statistics are generalities and how they apply to any specific property is unknown without a tailored comparative market analysis. All numbers should be considered approximate. Please contact us with any questions or concerns. This information is deemed reliable but not guaranteed. This market report includes forecasts, projections and other predictive statements that represent Team Tami’s assumptions and expectations in light of currently available information. These forecasts are based on industry trends, circumstances involving clients and other factors, and they involve variables and uncertainties. The Playa Vista market’s actual performance results may differ from those projected in this market forecast. Consequently, no guarantee is presented or implied as to the accuracy of specific forecasts, projections or predictive statements contained herein. 4 Playa Vista Fees – Do you have to pay them all?